David Slotnick/Business InsiderJetBlue founder David Neeleman. David Neeleman is one of the most successful airline entrepreneurs in the world. He’s the founder of JetBlue and Azul as well as a cofounder of Morris Air and WestJet. He’s also a co-owner of TAP Air Portugal. Neeleman cofounded Morris Air in 1984, at the age of 25. The airline boss shared with Business Insider the advice he would give his 25-year-old self at the beginning of his career. David Neeleman is one of the most experienced and successful entrepreneurs in the history of the airline industry. The affable, Brazilian-born, Utah-raised businessman has had a hand in the founding of four successful airlines over the last 35 years. He’s the founder of JetBlue and Azul Brazilian Airlines as well as a cofounder of Morris Air and WestJet. He’s also one of the co-owners of Portuguese national airline TAP Air Portugal. Earlier this year, Neeleman, 58, announced plans to launch his fifth airline, an American low-cost carrier called Moxy. Neeleman’s career as an airline entrepreneur started early, when he co-founded Morris Air in 1984, at the age of 25. He served as Morris Air’s president from 1988 until it was sold to Southwest Airlines in 1994 for a reported $US129 million. “We were pretty vulnerable and Southwest wants us, plus when someone hands you $US15 million at 33 years old you’re like, ‘Yeah! I’ll take it,'” Neeleman added. After working at Southwest Airlines for a while after the merger, he left and helped cofound WestJet, now Canada’s second largest airline. In 1998, Neeleman founded JetBlue, a New York-based boutique airline that melded premium service and amenities with low cost. He followed that up with the founding of Azul Brazilian Airlines in 2008, a venture that has now become one of the largest carriers in South America. 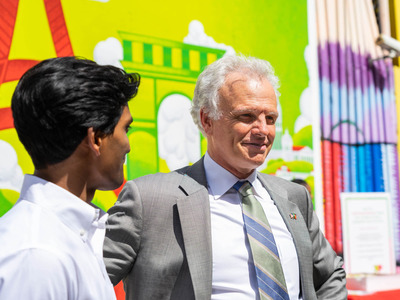 So what advice would the David Neeleman of today give to his 25-year-old self? Have personal control of the business and know the industry in which you are working, Neeleman said. From there, the goal is to differentiate yourself from the pack.